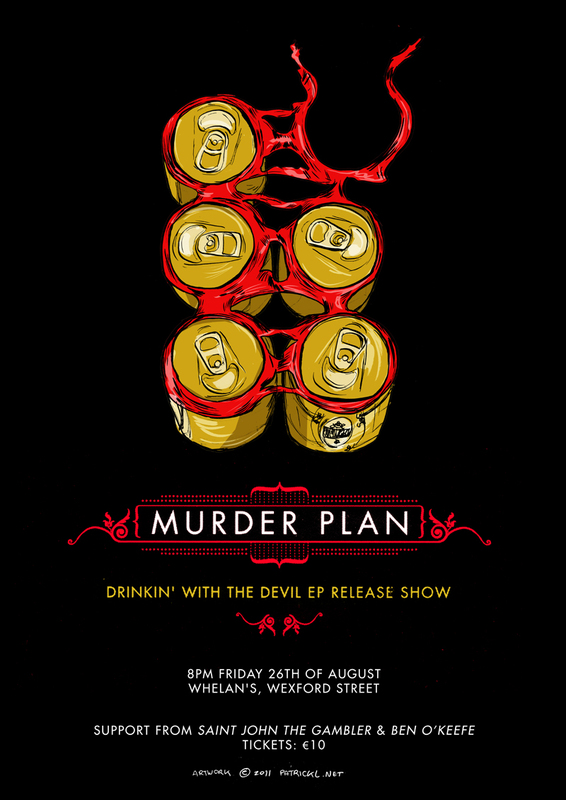 Former musical cohorts of mine Murder Plan have gotten their act together big time since I (amicably) vacated the drum stool and are set to release their debut ep Drinkin’ With The Devil. They asked me to come up with a poster for their release gig in Whelans with no specific brief except to relate the image to the title of the record. I jumped at the chance to do something completely off the cuff. I’ve been spending a lot of time on a very exciting graphic novel project that’s still a bit hush hush, and haven’t had much of a chance to do any pure image making for it’s own sake, so this was a lot of fun to do. Speaking of that secret project, if you listened to the recent Comic Cast’s ‘Square Bound’ audio interviews you might have indirectly heard it announced. Hopefully I’ll get permission to preview some of that material here soon. Trust me, it’s going to be good. The same weekend of the gig the Dublin Zine Fair is happening as part of the Ranelagh Arts Festival. I’ll have a stall there, very possibly with a new mini comic/zine in tow. Fingers crossed.